Ranked as the most prolific international business scholar in the Asia-Pacific region, and 14th in the world, in Xu et al.’s (2008, Asia Pacific Journal of Management, 25(2): 189-207) survey of 2,495 authors in leading international business journals. Winner of the 2007 Faculty Prize for Outstanding Performance / Achievement (Research and Scholarly Activities), Hong Kong Polytechnic University. Winner of the 2003 Charles C. Slater Memorial Best Paper Award for the best paper published in the Journal of Macromarketing, Volumes 21-22 (Ellis and Pecotich, 2002). Awarded research grants worth a total of nearly HK$2m. Ellis, P.D. 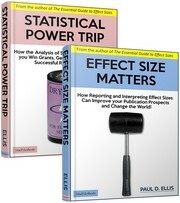 (2010), The Essential Guide to Effect Sizes: An Introduction to Statistical Power, Meta-Analysis and the Interpretation of Research Results. Cambridge University Press. Ellis, P.D. (2011), “Social ties and opportunity recognition,” Journal of International Business Studies, 42(1): 99-127. Ellis, P.D., H. Davies & A. Wong (2011), “Export intensity and marketing in transition economies: Evidence from China,” Industrial Marketing Management, 40: 593-652. Ellis, Paul D. and Zhan Ge (2011), “How international are the international business journals?” International Business Review, 20: 100-112. Ellis, P.D., (2010) “Effect sizes and the interpretation of research results in international business,” Journal of International Business Studies, 41(9): 1581-1588. Ellis, P.D. (2010), “Trade intermediaries and the transfer of marketing knowledge in transition economies,” International Business Review, 19(1): 16-33. Ellis, P.D. (2010), “Is market orientation affected by the size and diversity of customer networks?” Management International Review, 50(3): 325-345. Ellis, P.D. (2008), “Does psychic distance moderate the market size-entry sequence relationship?” Journal of International Business Studies, 39 (3):351-369. Ellis, P.D. (2007), “Distance, dependence and diversity of markets: Effects on market orientation,” Journal of International Business Studies, 38(3): 374-386. Ellis, P.D. (2007), “Paths to foreign markets: Does distance to market affect firm internationalization?” International Business Review, 16(5):573-593. Wong H.K. and P.D. Ellis (2007), “Is market orientation affected by the product life cycle?” Journal of World Business, 42(2): 145-156. Ha L.C. & P.D. Ellis (2006), “Does relationship marketing exist in cyberspace?” Management International Review, 46(5): 557-572. Ellis, P.D. (2006), “Factors affecting the termination propensity of mediated exchange relationships,” European Journal of Marketing, 40 (11/12):1169-1177. Ellis, P.D. (2006), “Market orientation and performance: A meta-analysis and cross-national comparisons,” Journal of Management Studies, 43(5): 1089-1107. Ellis, P.D. (2005), “The traders’ dilemma: The adverse consequences of superior performance in mediated exchanges,” International Business Review, 14(4): 375-396. Ellis, P.D. (2005), “Market orientation and marketing practice in a developing economy,” European Journal of Marketing, 39 (5/6): 629-645. Ha L.C. & P.D. Ellis (2004), “Marketing in cyberspace: What factors drive e-commerce adoption?” Journal of Marketing Management, 20(3-4): 409-429. Ellis, P.D. (2003), “Social structure and intermediation: Market-making strategies in international exchange,” Journal of Management Studies, 40(7): 1677-1702. Ellis, P.D. (2003), “Are international trade intermediaries catalysts in economic development? A new research agenda,” Journal of International Marketing, 11(1): 73-93. Wong, P. & P.D. Ellis (2002), “Social ties and partner identification in Sino-Hong Kong international joint ventures,” Journal of International Business Studies, 33(2): 267-289. Ellis, P.D. & A. Pecotich (2002), “Macromarketing and international trade: Comparative advantage versus cosmopolitan considerations,” Journal of Macromarketing, 22(1): 32-56. Ellis, P.D. & A. Pecotich (2001), “Social factors influencing export initiation in small and medium-sized enterprises,” Journal of Marketing Research, 38(Feb): 119-130. Ellis, P.D. (2001), “MTV vs. Channel V,” Asian Case Research Journal, 5(2): 167-201. Ellis, P.D. (2001), “Adaptive strategies of trading companies,” International Business Review, 10: 235-259. Ellis, P.D. & A. Pecotich (2001), “Finding international exchange partners: The role of social ties,” Global Focus, 13(2): 121-133. Davies, H. and P.D. Ellis (2000), “Porter’s ‘Competitive Advantage of Nations’: Time for a final judgment?” Journal of Management Studies, 37(8): 1189-1213. Ellis, P.D. (2000), “Social ties and foreign market entry,” Journal of International Business Studies, 31(3): 443-469. Lee M.Y. and P.D. Ellis (2000), “Insider-outsider perspectives of guanxi,” Business Horizons, (Jan-Feb): 25-30. Ellis, P.D. (1999), “Hong Kong as a complex adaptive system,” Asia Pacific Business Review, Special Issue, 6(1):33-55. Ellis, P.D. (1998), “Hong Kong’s emerging tertius role in the global economy,” Business Horizons, (Sept-Oct): 37-43. Chan H.N. and P.D. Ellis (1998), “Market orientation and business performance,” International Marketing Review, 15(2): 119-139. Ellis, P.D. (1998), “Chaos in the underground: Spontaneous collapse in a tightly-coupled system,” Journal of Contingencies and Crisis Management, 6(3): 137-152. Ellis, P.D. (1998), “Johnson Electric: Internationalisation strategies of a non-dominant micromotor company,” Asian Case Research Journal, 2(1): 53-66. Ellis, P.D. (1997), “Uncertainty in the Hong Kong Special Administrative Region,” Business Horizons, 40(2): 59-64. Ellis, P.D. & A. Pecotich (1996), “Determinants of international competitiveness of West Australian SMEs,” New Zealand Journal of Business, 18(1): 79-98. Ellis, P.D. (2010), “International trade intermediaries,” Sheth, J. and N.K. Malhotra (editors), Wiley International Encyclopedia of Marketing. John Wiley and Sons, Chichester, UK. Ellis, P.D. (2008), “Chaos in the underground: Spontaneous collapse in a tightly-coupled system,” in R.A. Boin (editor), Crisis Management, Vol I. Los Angeles: Sage, 199-219. Ellis, P.D. (2000), “Hong Kong as a Complex Adaptive System,” in C. Rowley and R. Fitzgerald (editors), Managed in Hong Kong, Frank Cass, London, 33-55. Ellis, P.D. & A. Pecotich (1998), “Export marketing: Historical development and theoretical integration,” in Gabriel Ogunmokun (editor), Contemporary Issues in International Business and Marketing, Academic Press, UWA, 1-40. Ellis, P.D. (2005), “MTV vs. Channel V,” in Hitt, Ireland & Hoskisson, Strategic Management, 6th Edition, Thomson, C259-C270. Ellis, P.D. (1999, and subsequent editions), Euro Disney SCA case (B), in Warren J. Keegan, Global Marketing Management, Sixth Edition, Prentice-Hall, Englewood Cliffs, NJ, 118-123. Ellis, P.D. (1999), Euro Disney SCA (A & B) Teaching Note, in Warren J. Keegan, Global Marketing Management: Instructor’s Manual, Prentice-Hall, Englewood Cliffs, NJ. Ellis, P.D. (1997), Johnson Electric: Micromotor Giant, Case Clearing House, Management Development Centre of Hong Kong. Zhan G and P.D. Ellis, (2009), “An assessment of the geographic scope of international business research,” Paper presented at the Academy of International Business: South East Asia Regional chapter meeting, Hong Kong, 3-5 Dec.
Wong H.K. and P.D. Ellis, (2009), “Wal-Mart goes green: The impact on its supply networks in China,” Paper presented at the Academy of International Business: South East Asia Regional chapter meeting, Hong Kong, 3-5 Dec.
Wong H.K., W. Lam, and P.D. Ellis, (2009), “The effects of LMX quality and perceived marketing capabilities on employees’ learning orientation,” Paper presented at the Academy of Management annual meeting, 7-11 August, Chicago. Wong H.K., W. Lam, and P.D. Ellis, (2009), “Development of marketing capabilities through multinational buyers: An empirical investigation in a transition economy,” Paper presented at the American Marketing Association Summer Marketing Educators’ Conference, 7-10 August, Chicago. Wong H.K., P.D. Ellis and W. Lam (2009), “Developing the marketing capabilities for superior business performance: Evidence from transition economies suppliers,” paper presented at the Academy of International Business annual meeting, 27-30 June, San Diego. Wong H.K. & P.D. Ellis, (2008), “Do relationships with multinational buyers boost the marketing capabilities of transition economy suppliers?,” Paper presented at the Academy of International Business: South East Asia Regional chapter meeting, Kuala Lumpur, Malaysia, 4-6 Dec.
Wong H.K. & P.D. Ellis, (2008), “Interfirm relationships and learning: Effects on the marketing capabilities of transition economy suppliers,” Paper presented at the Australian and New Zealand Marketing Academy meeting, Sydney, Australia, 1-3 Dec.
Zhan G. and P.D. Ellis, (2008), “International exchange partner identification: methods, antecedents and consequences,” Paper presented at the Academy of International Business Meeting, Milan, Italy, 1-3 July. Ellis, P.D. & Zhuang G.J. (2006), “The acquisition of foreign marketing knowledge via indirect export channels: Evidence from central China.” Paper presented at the Academy of International Business Meeting, Beijing, PRC, 24-27 June. Wong H.K. & P.D. Ellis, (2005), “Is market orientation affected by the product life cycle? Some findings from a non-Western setting.” Paper presented at the 5th American Marketing Association/Academy of Marketing Joint Biennial Conference, Dublin, Ireland, 5-8 July. Ellis, P.D., A. Pecotich & Zhuang G.J. (2005), “National development, knowledge transfer and marketing intermediaries in China.” Paper presented at the 30th Annual Macromarketing Conference, St. Petersburg, FL, 28-31 May. Wong H.K. & P.D. Ellis, (2004), “Effect sizes in market orientation research: Implications and unexpected findings.” Paper presented at the Academy of International Business Southeast Asia Regional Conference, Macau, China, August 5-7. Ellis, P.D. (2004), “Dependence and diversity of markets: Effects on market orientation.” Paper presented at the Academy of International Business meeting in Stockholm, Sweden, 10-13 July. Ellis, P.D. (2004), “Marketing in a developing economy,” Paper presented at the European Marketing Academy meeting in Murcia, Spain, 18-21 May. Ellis, P.D. & A. Pecotich (2001), “Macromarketing and globalization: A view of the issues,” in Don R. Rahtz and Pierre McDonagh, (eds. ), Macromarketing 2001 Globalization and Equity: The Proceedings of the 26th Annual Macromarketing Conference, ISBN: 953-6148-2-0, pp.11-15. Ellis, P.D. (2001), “International trade intermediaries and the development of local marketing.” Paper presented at the European Marketing Academy (EMAC) Conference, Bergen, Norway, May. Ha L.C. & P.D. Ellis (2001), “International marketing on the internet: An exploratory investigation into the extent of adoption.” Paper presented at the European Marketing Academy (EMAC) Conference, Bergen, Norway, May. Wong, P. & P.D. Ellis (2000), “Finding partners in southern China: An exploratory investigation into the formation of international joint ventures.” Paper presented at the Academy of International Business Southeast Asia Regional meeting, Oliver Yau (editor): City University, pp. 197-203, 23-26 July. Lee M.Y. & P.D. Ellis (1999), “Guanxi: A comparison of mainland and overseas Chinese perspectives.” Paper presented at the Academy of International Business Meeting, Charleston SC, USA, 20-23 Nov.
Ellis, P.D. (1998), “Evolution of a multinational trading corporation: The Li & Fung story.” Paper presented at the Europe International Business Academy Conference, Jerusalem, Israel, 13-15 Dec.
Ellis, P.D. (1998), “Foreign market entry revisited: Unresolved issues, ‘messy’ research, and old conceptual wineskins.” Paper presented at the Academy of International Business Meeting, Vienna, Austria, 7-11 Oct.
Ellis, P.D. & A. Pecotich (1998), “Export marketing: Initiation and progress.” Paper presented at the European Marketing Academy (EMAC) Conference, Stockholm School of Economics, Stockholm, Sweden, Per Andersson (editor), Conference Proceedings, Vol. 2, pp.421-436, 20-23 May. Ellis, P.D. (1996), “Hong Kong’s emerging tertius role in the global economy: Some implications for EU traders.” Paper presented at the Europe International Business Academy Conference, Stockholm, Sweden, 15-17 Dec.
Ellis, P.D. & A. Pecotich (1996), “Determinants of international competitiveness: An exploratory evaluation of Porter’s (1990) theory in the case of West Australian SMEs.” Paper presented at the Academy of International Business Southeast Asia Regional Conference, Dunedin/Queenstown, New Zealand, 17-20 June. Ellis, P.D. & A. Pecotich (1991), “Europe 1992: Some speculations for Australian and New Zealand managers.” Paper presented at the Australia-New Zealand Academy of Management Educators (ANZAME) Conference, Bond University, Queensland, Australia, 4-6 Dec.